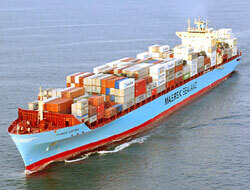 MAERSK Line, Safmarine and DAL Deutsche Afrika-Linien plan to add capacity to their South Africa-Europe service. MAERSK Line, Safmarine and DAL Deutsche Afrika-Linien plan to add capacity to their South Africa-Europe service, by offering an extra fortnightly "SAECS Reefer Express" loop that will alternate with the existing fortnightly SAECS 2 loop, in order to operate weekly departures from common ports on both loops, Exim News Service reported. However, the SAECS 1 loop reportedly remains unchanged and will continue to be operated with seven 4,500-4,900-TEU boxships. The current SAECS 2 loop turns in eight weeks, using four ships of 1,600-1,850 TEUs. By comparison, the new "SAECS Reefer Express Service" will turn every six weeks on a truncated rotation, and use three ships of the same size as those used on the SAECS 2, which will be progressively deployed over a six-week period. The new extra service, it is understood, will call at only four ports, with Cape Town as the single South Africa loading port, and Lisbon, Antwerp and Thamesport expected to be European destination ports. However, this remains to be confirmed. The Maersk-chartered San Andres 1,842-TEU containership, equipped with 419 reefer plugs, is expected to kick off the new loop this week. The SAECS 2 will continue to make 12 port of calls, including double calls in South Africa and a new call at the UK Thamesport terminal, to be included later this month. The extra capacity (from the SAECS Reefer Express Service) is expected to accommodate seasonal demand for reefer cargo for the southern hemisphere fruit season. The extra loop will be introduced this month and, together with the existing SAECS 2 loop, will result in a weekly, seven-vessel service for the peak reefer season period, anticipated to run from April 13 to the end of the reefer season (presently expected to run until September).